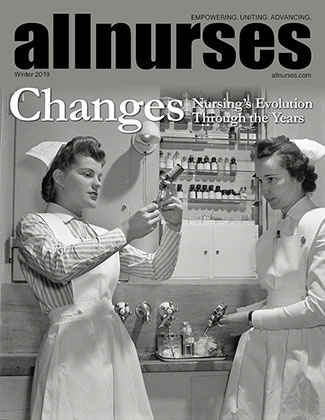 Survey: How old were you when you entered the nursing profession? I was 19 my first job was working weekends in a nursing home as an enrolled nurse whilst I studied for my RN. I feel so young and very proud that 16 years later I am still working in the profession. OK the world of nursing is in a bad way, we are over worked and under paid and the respect of patients just isnt what it used to be. I can understand that all of this is the down side, but I like to think about my forebears - Australian War nurses that got shot at, captured, and had to manage on far less pay than we do today. Yet they still managed to inspire nurses like myself to join the proffession. I wonder sometimes if it is not so much the job that has changed but the nurses. That's not to say that workloads should not be humane, nor renumeration reasonable, but please try and remember if we want a strong and enthusiastic workforce, if we want to recruit and retain into our profession then we have to stay positve. Every day I am exsposed to people who are new nurses and I can choose to give them the impression that I hate my job or I can try and help them to understand why I am still here after 14 years! Frankly I don't think I would be happy doing anything else. A quick word on the state of the world out there, what is happening to nurses is a symtom of the change in the way society work. All the "helping" professions are finding that recruitment is getting harder. I believe thats because society sends the message that helping people is no longer a noble use of time. We all focus on the almighty dollar as our way of measuring our value. Surly nursing should be using its considerable political clout (in an aging world) to try and reinstate some of the values that our profeesion is founded on- Honour, honesty, integrity, and altruism.